As you probably heard, Thanksgiving is around the corner and based on my server stats that means for most of you the Christmas holiday shopping/spending season will begin Friday. Since I live in Torrance and we are the center of the craft beer explosion in the Greater Los Angeles Area, I figured I should give some tips to those of you that will be coming to our malls; primarily Del Amo Fashion Square and the South Bay Galleria. You are in luck; if you do have to venture to these locations for your Christmas shopping there is quite a bit of good beer available without having to give up your parking spot. Of course, if you can drop the wife off you can take your own mini craft beer tour and avoid the parking situation entirely, but if you have to go inside I have you covered. I ventured off to the newly remodeled Del Amo Fashion Square and immediately rewrote this article in my head. I had planned one thing but parking was mind blowing and it was the Tuesday before Thanksgiving at 1:00 PM. My advice is that if you are shopping at Del Amo, find a central parking spot and stick with it. Trying to drive to the other end would just be silly. I don’t visit the mall often, but when I do I find the parking is best on the east side; so you want to get to the southwest corner of Madrona and Fashion Way. When you see the AMC sign, turn south into the parking lot. You may end up having to use the structures, but they are new and I really have no knowledge of how well they are set up. While it may not feel like it weather-wise around here, it is that time of year again; autumn, which means Oktoberfest will be celebrated from Munich to Shanghai; from Canberra to Blumenau and now from Torrance to Corona. 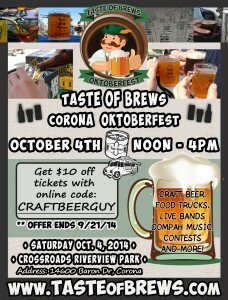 Taste of Brews will be having their inaugural Taste of Brews’ Oktoberfest on Saturday October 4 from noon until 5:00 PM at Crossroads Riverview Park in Corona. Since this is their first Oktoberfest I cannot provide photos and a description of how much fun I had last year, but I have gone to two of the Taste of Brews Long Beach festivals and had a blast, so if history is any indicator, this should be another good time. Some of the breweries that will be in attendance are Inland Empire locals Black Market Brewery, Brew Rebellion, Bootlegger’s and I & I Brewing along with such beer festival regulars like Fireman’s Brew, Samuel Adams Brewery, Firestone Walker and BJ’s restaurant. In addition to the beer, Oktoberfest provides live entertainment including Linda Herman’s Alpine Band and Inland Empire locals, The Tomcats. 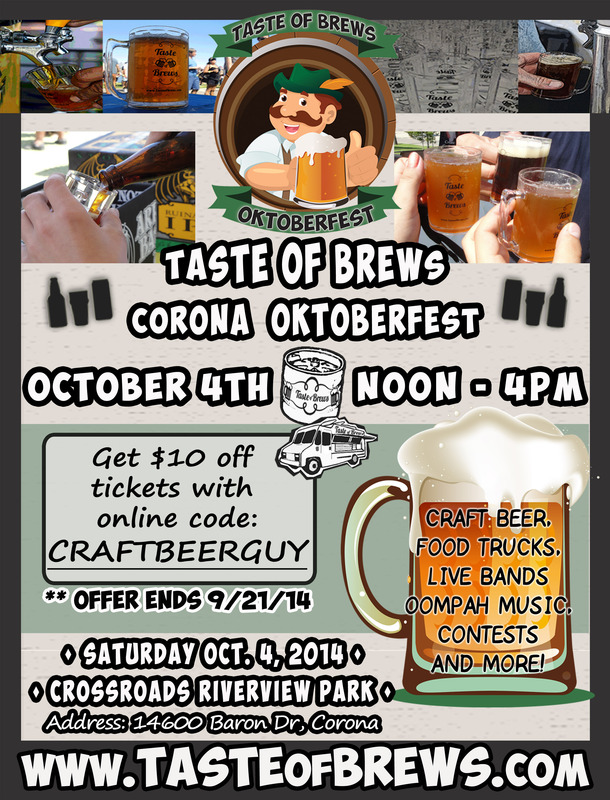 Of course there will be German foods available along with other food trucks. And since no Oktoberfest would be complete without dancing and games there will be Chicken Dance contests, beer stein endurance contests, balloon blowing contests and yodeling contests. Prizes will be awarded for best costumes, so if you own lederhosen this would be a great time to break it out.